From the expert craftsmen at Kraus, this vessel sink combines timeless style and modern efficiency into an elegant unit. Made from ceramic, this sink is both wear resistant and stylish. When your bathroom needs a new look, start fresh with this top-of-the-line sink. This sink from Acri-Tec adds a nice touch of elegance to any bathroom. Even after years of everyday use, the sink's sturdy ceramic construction keeps its beautiful appearance. Perfect for all kinds of bathroom styles, this sink is fantastic choice for your next home improvement project. As stylish as it is durable, this sink by Acri-Tec makes a terrific addition to any bathroom. You'll have no problem maintaining this stylish unit, made with ultra-durable ceramic. You'll be glad you chose this top-grade sink for your next home improvement project. Spruce up the look of your bathroom with this fine-crafted, efficient sink from Kraus. Its tough ceramic design can withstand years of everyday use, maintaining a stylish appearance. You'll be glad you chose this top-grade sink for your next home improvement project. The perfect combination of style and lasting durability, this sink from Kraus is just the upgrade your bathroom needs. Its tough ceramic design can withstand years of everyday use, maintaining a stylish appearance. Since this sink can be paired with a variety of bathroom styles, it makes a terrific choice for your next home improvement project. ElavoWhite 16.25-inch x 5.20-inch x 16.25-inch Square Ceramic Bathroom Sink with Drain in Bronze From the expert craftsmen at Kraus, this vessel sink combines timeless style and modern efficiency into an elegant unit. 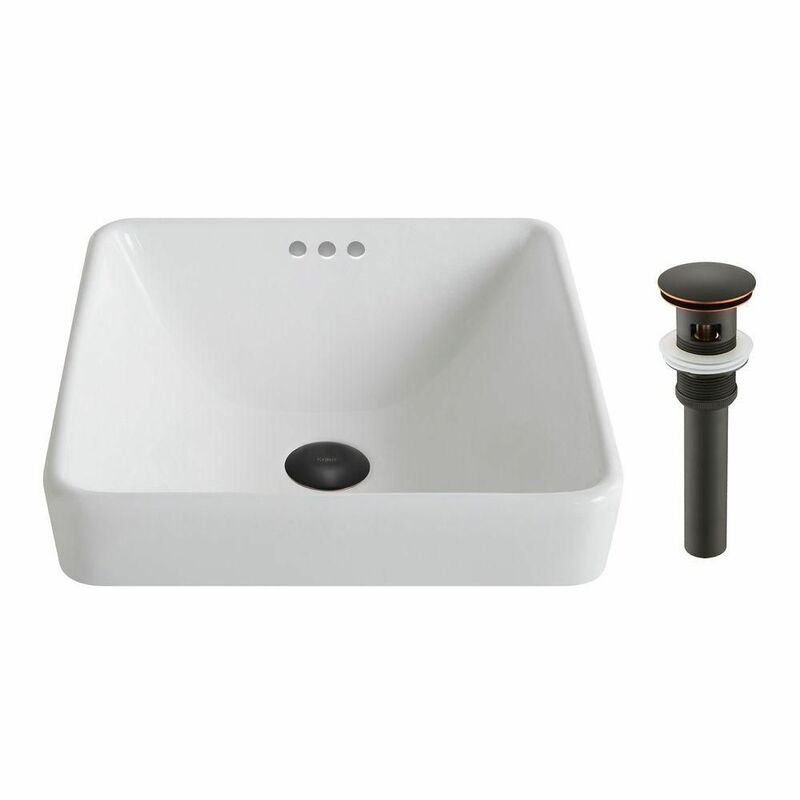 Made from ceramic, this sink is both wear resistant and stylish. When your bathroom needs a new look, start fresh with this top-of-the-line sink. ElavoWhite 16.25-inch x 5.20-inch x 16.25-inch Square Ceramic Bathroom Sink with Drain in Bronze is rated 5.0 out of 5 by 6. Rated 5 out of 5 by Yatesfam from Love this sink! The sink is beautiful! High quality and finish! Looks fantastic in an old dresser we converted to a vanity.